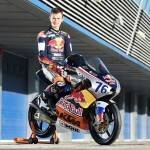 On 26th and 27th of June, 3rd and 4th stages of Red Bull MotoGP Rookies Cup were held in Assen, Netherlands. A 16-year-old Makar Yurchenko from St. Petersburg again took the challenge to fight for the ticket in the MotoGP World Championship with other 23 young riders from all over the world. This weekend Makar Yurchenko made a good pace to fight for the 5th position during the 4th stage of Red Bull MotoGP Rookies Championship. Makar Yurchenko: “The circuit in Assen was completely new for me. We had two practice sessions, 30 minutes each, and in the same day we got the qualification. Definitely this short time is not enough for knowing the track perfectly. I knew this, so I tried to study the Assen TT in advance, as best I could. There were 3 riders from Netherlands among 23 teenagers who were fighting with me for best positions. They knew the track like they know their way home! But in result I managed to leave two of three Dutchmen behind my back during the race”. Makar Yurchenko started both races from 9th position on the grid. On the start of the 3rd stage he lost few positions but managed to recuperate and fight for the 10th place. The sudden crash of Oly Simpson prevented Makar from climbing few positions higher. As a result Yurchenko crossed the finish line 11th, with no time enough left for struggling. 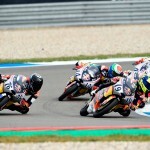 The 4th stage of Red Bull MotoGP Rookies Cup brought the Russian a fantastic battle in the group for the 5th place with japanese Ayumi Sasaki, spaniard Marc Garcia and Robert Schotman (Netherlands).On the last laps Sasaki overcame Yurchenko and Russian pilot lost his position. Having recuperated the distance fast, Yurchenko managed to cross the finish line on the 9th position, with a fantastic result in the battle.